I have never been a fan of the Cape Town Slow Festival, otherwise known as the N1 at 5 o’clock. But the Robertson Slow Festival held a certain appeal: there was wine involved. A lot of wine. 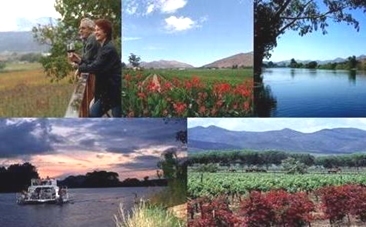 This annual celebration of food and wine and, importantly, the time that should be taken to savour them is hosted in 26 wineries and guesthouses in the four small towns of the Robertson Wine Valley. We felt compelled to conduct a thorough “audit” of the festival, for quality control purposes of course. Friday evening started off with a ‘Safari Dinner’ in McGregor, with sushi-making on Saturday in Montagu followed by a 5 course dinner close to Ashton. The friendly Cedar Lodge in Robertson served as a very comfortable and central home base. The Lord’s Wines Safari Dinner consisted of three parts: oysters and Cap Classique in the wine show room followed by a barrel tasting and starters in the cellar. The evening was capped off by a main meal in the Scottish-inspired lodge. Long weekend traffic caused us to miss the oysters but thanks to some very tasty biltong and blue cheese soup paired with Chenin Blanc straight out of the wine barrel, we made a startlingly quick recovery. The main meal of oxtail was so engaging that by the time my plate was empty, the wine glass was all but full. The experience as a whole was one of a dedicated team of flavours working together in perfect harmony. Not an easy night to beat. But then there was Mimosa Lodge’s interactive sushi demo the next afternoon which more than held its own. With a whole Norwegian Salmon staring us down, we took our seats. Our sushi sensei, Jackie, took us through the whole process, from skinning and slicing the fish, to rolling of the rice and the sushi and arranging the result on the plate. Our salmon roses looked a little wilted but the Plus One’s maki attempt scored him a congratulatory handshake from Jackie-san. Paring the sushi with Sauvignon was the only part of the afternoon where we did not need any instruction. Paul and Lynne Goddard were great hosts at Cedar Lodge, our home-from-home for the weekend. Paul used to be a race car driver. Needless to say I wolfed down my English breakfast in peace while the Plus One listened to tales of the track with wide eyes. With so many people congregating for a convivial weekend, there was plenty of scope for random interesting conversations. The one that will stick with me the most was at Jan Harmsgat on Saturday evening when I sat next to a former Umkhonto we Sizwe comrade. He told me about the time he transported explosives and used a date with a pretty girl as a cover. We could have made a serious dent in the Regional Food Market on Sunday had we not stuffed ourselves for two days straight. A few baked goods did manage to fall in my bag though as I rolled through. Not a barcode or a Made in China in sight. When working out the itinerary for the weekend I was tempted to fit in as many things as possible. Except for an impromptu tasting at Graham Beck squeezed in on Saturday morning, I am glad that we kept the weekend activities to a ‘mere’ four excursions. The key to the Festival is to take the time to thoroughly experience a small number of events. Keep it Slow. For the rest, there’s always next year.